A year in Athens, Greece, will provide Classics Professor Leslie Day with an opportunity to close nearly three decades of research. Day, chairman of the Wabash Classics Department, has been awarded one of two Visiting Whitehead Professorships at the American School of Classical Studies at Athens for the 2005-06 school year. The grant will be used primarily for research; and for Day, an opportunity to finish off a project she began in 1978. 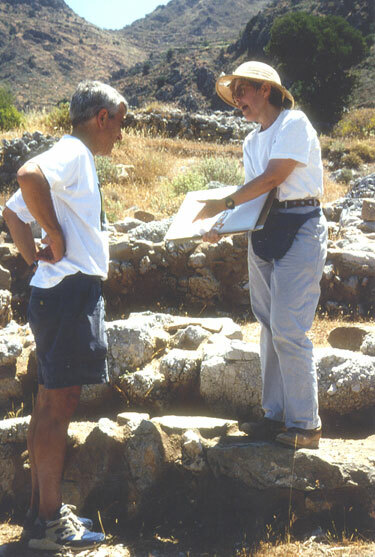 "I will be finishing off the publication of my excavations at Kavousi on Crete in seven volumes," she explained. "I will also give a graduate seminar in the winter. "This is a wonderful opportunity for me to teach at the graduate level and to have the best and brightest of young people interested in my field. It will be a novel experience. I am going to have the students helping me by doing some of the research on burial practices on Crete." Day was one of the first American archeologists to gain permission to excavate at Kavousi. Day was among pioneers who dug at Kavousi and discovered artifacts from the Greek "Dark Ages," a period between 1200 B.C. and 700 B.C. which saw the devolution of the complex Greek civilization into a number of city-states. "I am really looking forward to spending the year in Greece and to finishing off this long-term project," Day said. "I began at Kavousi in 1978, which makes the project much older than any of my students. The digging was great fun, but the studies and writing are less so, although I keep finding new things to get excited about." And Day will not get totally away from Wabash while in Greece. She reports Jeremy Ott ’02 will be at the school during the year. Susanne Hofstra, who taught for a year at Wabash during Day’s last leave, will be in Athens filling a two-year teaching position. Leslie’s husband, Joe Day, also a Professor of Classics, will be a Senior Associate Member of the American School. The American School of Classical Studies at Athens provides graduate students and scholars from some 168 affiliated North American colleges and universities a base for research and study in the history and monuments of Hellenic civilization. Since its earliest years, the school has sponsored archaeological exploration. In 1896, it began digging at ancient Corinth, and today, over 100 years late, the excavation continues, providing a training ground for new generations of North American archaeologists and a constant flow of information about Greece’s past. "The school is a research institute with an absolutely fabulous Classics library," Day explained. "It also runs a program to introduce Classics graduate students from institutions in North America to Greece in all its variety."